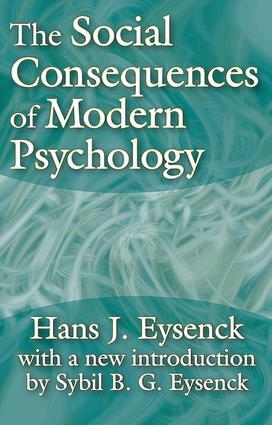 In The Social Consequences of Modern Psychology Eysenck takes the position that social science has real substance, and its findings ought to be applicable to social problems of our times. Although there is little that scientists can do about war and its prevention, or about social unrest and upheaval, or about strikes and other confrontations, there are a number of questions to which we can give tentative answers. This book deals with some of these questions, and finds some of the answers.Eysenck begins with a look at a paradox of modern psychology. Experimental psychologists use strictly scientific methods to investigate what to many people seem trivial and sterile problems, yet some social psychologists, psychiatrists and psychoanalysts investigate what are clearly important and socially relevant problems, but use methods and theories whose scientific rigor is doubtful at best. This paradox is artificial and unnecessary. Methods of investigation and theories and concepts enable us to combine worthwhile problems and rigorous methods.The book takes a long look at a particular problem which Eysenck investigated in depth during his illustrious lifetime. This tour de force, by one of the magisterial figures of modern psychology, is written for people as well as about people. It is not a rehash of the voluminous writings of lawyers, poets, politicians, dramatists, historians, psychiatrists and others who have felt compelled to write about these psychological matters without even a smattering of psychological knowledge. It is, instead, based on empirical investigations that are too often declared to be nonexistent by publicists and politicos. The rat or the couch?